Create one-way links to your site from Squidoo.com and get lots more traffic, lots more hits and make more sales as a result of backlinks from one of the world’s most authoritative websites! 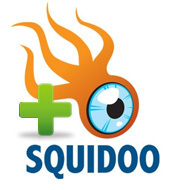 Squidoo.com is a highly authoritative (generally meaning “highly credible”) community website that allows its users (or “lensmasters”) to create pages (called “lenses”) about whatever subjects they so choose. These user created pages contain a great deal of quality content and quality content that is highly relevant to their blogs and websites. Whenever a Squidoo lens is created by a user, relevant tags are added to each lens too. All of the user-generated lenses are linked to the tag pages, which are in turn linked back to all the lenses that use the same tag. This is how automatic links are generated for the lenses you create in Squidoo. Your Squidoo lens’ PageRank increases because of the links it automatically receives from the tag pages. You can infinitely increase your web presence exponentially by creating Squidoo Lenses with links back to your website. They are an awesome resource to use in the marketing of your website. It is a well established fact that links generated from high ranked sites are of greater value than those generated from lesser ranked sites. Since Squidoo is a very highly ranked site, the links that you generate from it help your site achieve higher rankings. An authority site like Squidoo is a great online resource on any given subject. It is this credibility that attracts other websites to link up with it. This also helps in increasing your website’s credibility on the search engines. VodaHits will add your Squidoo Lens URLs to our RSS Blast service and will ping the URLs of your Squidoo Lens across 100 ping sites indefinitely until they have been 100% crawled by Google’s Googlebot! You can get indexed relatively fast for your keywords (if they do not have a massive amount of competition) because many of the major search engines (including the mighty Google) really, really like Squidoo lenses. In addition, most article directories are willing to allow you to connect to your Squidoo lens pages from the article resource box. Therefore, you can easily use your Squidoo lenses for affiliate marketing and promote your Squidoo lenses through article marketing. If you want to boost your Squidoo pages further, you can join Squidoo groups. This will generate extra links from other Squidoo lenses and assist in enhancing your search engine rankings. The Squidoo lens we create for you will include a minimum of one 300 word article, pictures relating to it and four to six other modules besides the link that you would like us to include. This service will also include promotion in all popular search engines including Google, Yahoo, MSN, Alexa, AOL, Ask Jeeves etc. In addition, you will also get over 1000 backlinks over a period of time. You can get instant traffic to your Squidoo lens and besides, you will also get good Squidoo lens-rank and a large number of backlinks thereby increasing your website’s Google PageRank from PR0 to PR4 or better. Squidoo lenses help you generate sales and huge traffic. However, the choice of your niche also plays a great role in revenue generation. We have content writing experts who will create a professional and unique Squidoo Lens for you. What will the word-count of my Squidoo Lens be? Your Squidoo lens will consist of a minimum of one (unique) 300 word article and we’ll insert related pictures into the Squidoo lens that we create for you. How many Keywords can I target on each Squidoo lens? Up to 10 keywords or key-phrases can be targeted on each Squidoo lens. Will I own the Squidoo Lens once VodaHits’ work is complete? Yes. As soon as VodaHits’ work is done, the Squidoo Lens will be released to your control immediately. Once this has been done you are free to make any changes you wish and use it in whatever way you like.